Audi presented an exhilarating line-up of luxury cars along with the Audi Sport quattro concept at the Auto Expo 2014 in Greater Noida. Audi Q3, Audi Q5 and Audi Q7. The brand with the four rings also showcased its recent and most powerful addition to the India fleet - the Audi RS 7 Sportback. Another highlight at the Audi stand was the Audi R18 e-tron quattro to celebrate Audi's success in motorsports. The Audi range was presented by Terence Johnsson, Vice-President, Overseas Sales of Audi AG and Joe King, Head, Audi India. "In 2013, Audi achieved new sales records in more than 40 markets and India was one of them with sales of 10002 units. We believe this market has tremendous potential for further growth of brand Audi. Reaffirming our commitment to the Indian market, we are bringing the Audi A3 Sedan - the next big Audi to India. We expect the Indian market to continue to grow and to contribute substantially to Audi's global sales," said Terence Johnsson. "We have kick-started 2014 on a strong note and as we continue to strengthen our market leadership, we are truly committed to deliver best value to our customers and maintain a passionate focus on offering unique products and service. We believe that the Indian market has tremendous potential and we will continue to focus on sustainable and profitable growth. Our presence in India is growing stronger by the day and we want to reach out to all Audi enthusiasts. We will continue with our network expansion strategy and plan to increase our network to 40 dealerships by end of 2014," said Joe King. 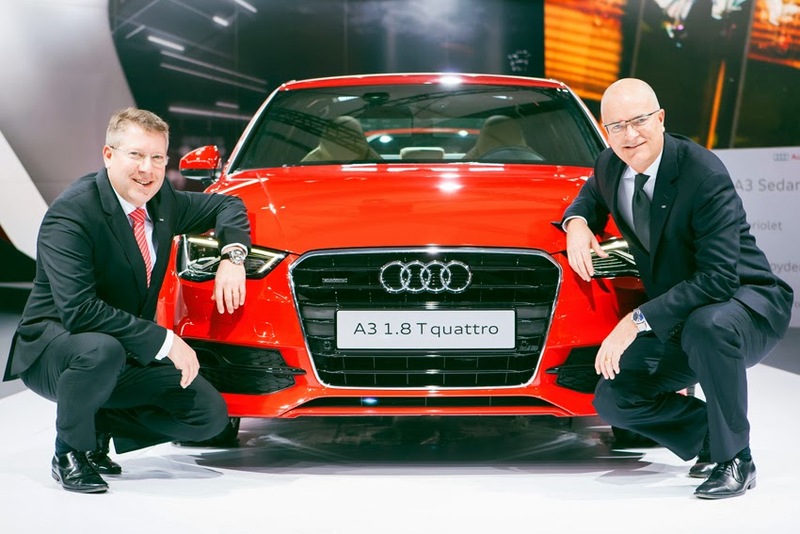 "The introduction of the Audi A3 Sedan, underlines our understanding of the Indian customer. This car will open a new customer segment and bring more and more fans into the Audi family. The Audi A3 Sedan is a car that reflects technology, everyday suitability and comfort but most of all true luxury," added King.